How can we make our immense digital universe feel more like a small neighborhood? It’s that sense of inclusiveness and connectedness that we try to foster here at Hootsuite, and we take pride when people take notice. 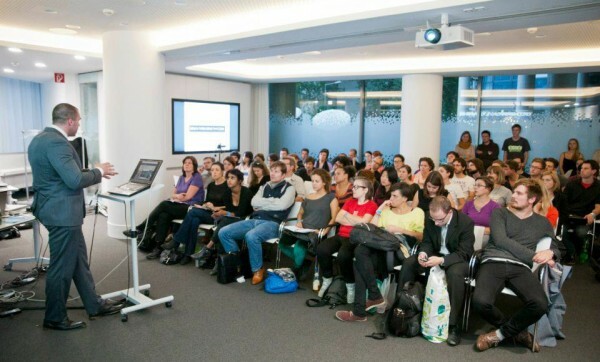 HootSuite Community Manager, Europe, Sharif Khalladi, recently spoke at Social Media Week Berlin, where his advice on fostering online communities was picked up by Deskmag’s Anna Cashman and Inc. Magazine’s Jessica Stillman. 1. Be extraordinary. Even if you build a fancy community around it, if your product isn’t amazing, the people won’t come. Invest time into making an extraordinary product that all of your developers can be proud of–enough to tell their friends. Once that’s done, take measures to stand out from the crowd. For example, HootSuite created HootSuite University, a special learning portal for users to access information about social media platforms. 2. Welcome clients into your family. HootSuite receives a lot of feedback from users telling them how much they love the product. Rather than just reaching out and thanking them, HootSuite established an envoy and ambassador program, inviting people from all over the world to be involved in the company. These ambassadors and envoys can organize HootUps, manage a country’s twitter account, or contribute in other engaging ways. 3. Give back to your community members. After all, it’s a community, which means relationships are two-way streets. If a user tweets about your product or compliments you, show them that their loyalty and outreach is valued. HootSuite often sends enthusiastic users stickers or t-shirts. 4. Humility matters. Be fair. Don’t value some clients more than others. Whether someone is a free user or has a pro account, they are all part of the same community. A community is nothing without each and every one of its members, don’t forget that. Want to learn more about fostering online communities? Our free Info Sheet: The Value of Community Building is designed to help you demonstrate the opportunities community engagement can bring to organization of all sizes.